I got this free Pirate Can Cozy pattern from the Lion Brand website. 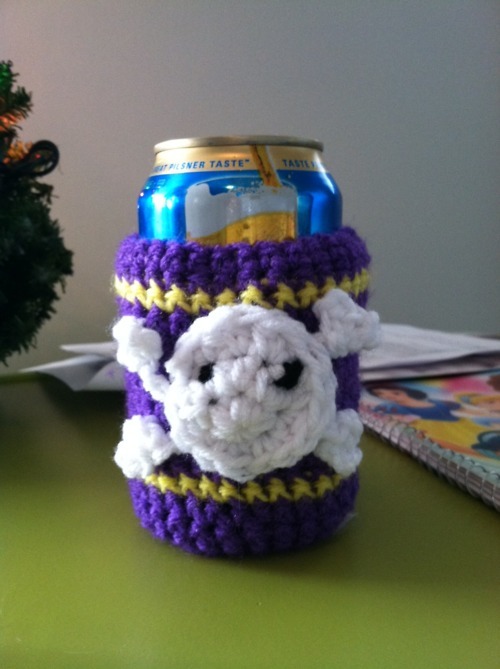 I made it for my old boss at East Carolina University because they are the Pirates and their colors are purple and yellow. I used Red Heart worsted weight yarn. 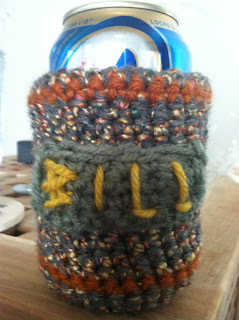 I got this free Father's Day Drink Cozies pattern from the Lion Brand website. I made this cozy for my Brother Bill for Christmas. I used Red Heart Fiesta worsted weight yarn in Platinum, Red Heart worsted weight yarn in Light Sage, Lion Brand Vanna's Choice worsted weight yarn in Mustard, and Vanna's Choice yarn in Rust.